with the Omaha Symphonic Chorus. with conductors Dr. Greg Zielke and Larry MacTaggart. Featured “Nebraska – My Heartland”, a new work for band and chorus by David Gardner. 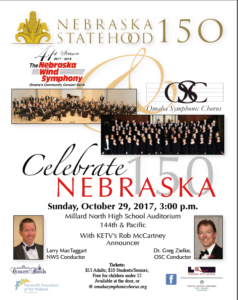 Also included the music of Nebraska native, Howard Hansen, Z. Randall Stroup, John Philip Sousa, Larry MacTaggart, and Keith Michael Davis. 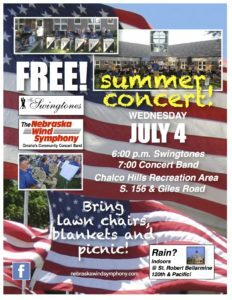 Check out the concert program. Featuring Camille Matoyer Moten, vocalist and an audience sing-a-long. 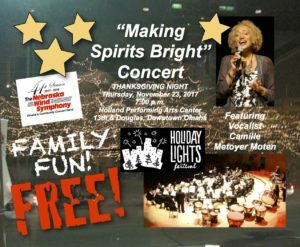 This is a FREE event taking place as part of the Downtown Holiday Lights Festival. 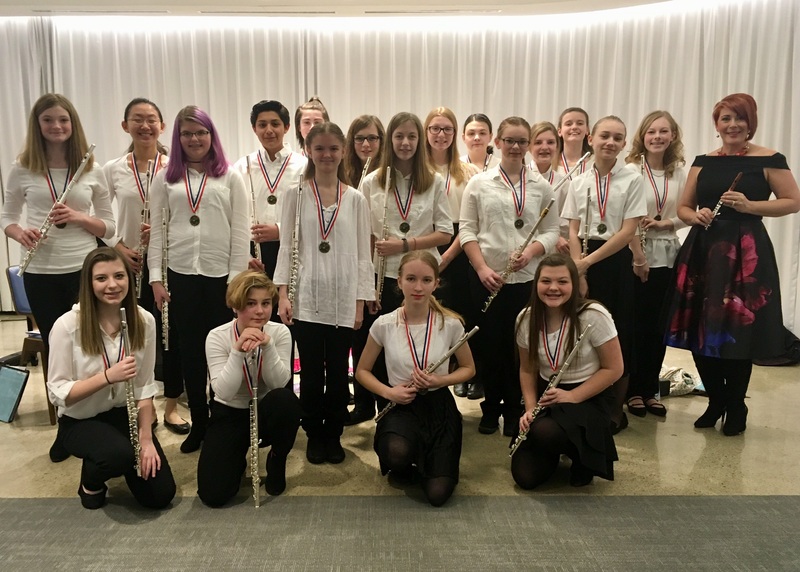 3PM – Omaha Conservatory of Music, 7023 Cass St.
featuring the NWS Middle School All-Star Flutes and Dr. Christine Beard, piccolo soloist. Thank You! to the nineteen (19) Middle School flutists participated in this concert. They performed marvelously! Omaha Conservatory of Music, 7023 Cass St. This concert features our 2018 NWS Memorial Scholarship/concerto competition winner, Samuel Kalhorn, will perform the 3rd movement of Hummel’s Trumpet concerto. 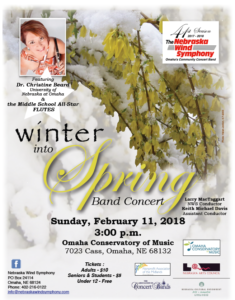 Kristin Parent, Jack Snider award winner and MCS band teacher, will guest direct a selection. Chiyo Trauernicht, Middle School Band Director at Blair, will guest direct “Red Dragonfly”, written especially for her by Keith Michael Davis. 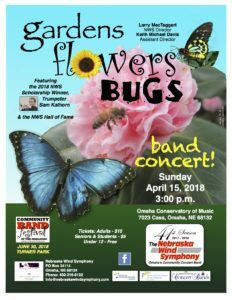 Ken Molzer, founder and director of the Papillion Area Concert Band, will direct Flight of the Monarch written byLarry MacTaggart in memory of Gene Brong, a trombonist with both the PAC Band and NE Wind Symphony. We will also recognize our 2018 Hall of Fame honorees. Hear Larry talk about the concert on KIOS. 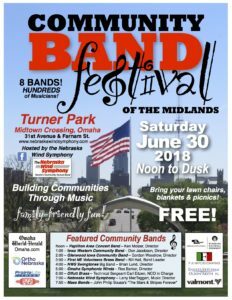 The first ever Community Band Festival of the Midlands was at Midtown Crossing’s Turner Park from noon to 8PM on Saturday, June 30, 2018. 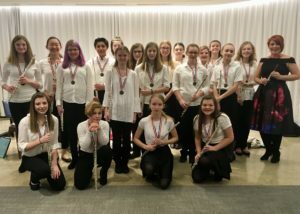 The Festival included eight wind and percussion ensembles from eastern Nebraska and western Iowa. Weather conditions curtailed the event and the concert portion by NWS. The first seven groups played about 40 minutes, leading up to a mass performance of Sousa’s “The Stars and Stripes Forever.” Thank you to everyone who came in support of the event or for their favorite community band. For more information, see our Community Band Festival page. We had another record setting crowd of nearly 800 people. Thanks to everyone for coming out to support NWS as we celebrated America. NOTE – because of the great success of this concert, we are looking for a venue that will better support our audience.